Still recovering from the loss of her parents, Elena Gilbert meets the evasive Stefan Salvatore. Without anybody knowing, vampires exist, and now that this one vampire has come to the town of Mystic Falls, will anything ever be the same. When Stefan's brother comes to town, Elena finds herself drawn to the two vampire brothers. When I first started reading the Vampire Diaries, I was immediately sucked in. 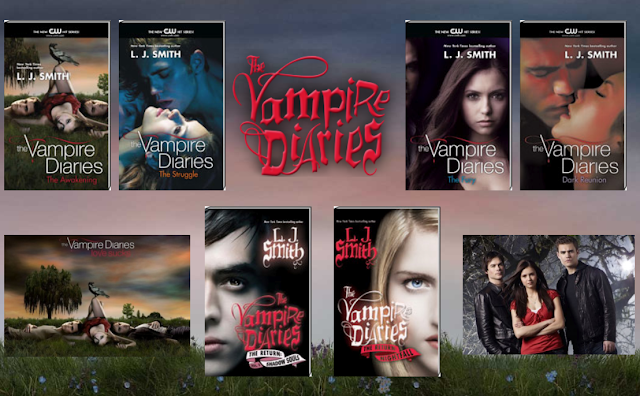 Contrary to popular belief that the Vampire Diaries is a copy of Twilight, the Vampire Diaries was actually published 14 years prior to Twilight, using some of the same ideas, but putting a spin on the characters, Vampire Lore and the history of the characters that Twilight lacks. The books are compelling and will keep you on the edge, wanting more and more of the wonderful world that L.J. Smith has created. If you are a fan of the show, then try reading the books. They deviate from the series, but they are still really entertaining. If you are a fan of the books, then you will love the series, it captures the best of the characters and portrays the main story line of the series well. really, more vampire fiction? i swear it's becoming a whole genre. what did you think about it? did you love it, like it, would you recomend it? Yes, I agree that it IS becoming it's own genre!! Because they are such big sellers at the moment, every author is jumping on the bandwagon! Skulduggery Pleasant: Mortal Coil out now!